China should adopt domestic legislation on police use of firearms that complies with international standards, in particular by prohibiting the shooting of escaping suspects or individuals assisting an escape unless they constitute a grave threat to life. The 1982 Constitution of the People's Republic of China (as amended through 2018), which "is the fundamental law of the state and has supreme legal authority" guarantees the protection of the dignity of all its citizens.Preamble and Art. 38, 1982 Constitution of China (as amended).The Constitution does not protect the right to life or to freedom from torture or other forms of inhumane treatment. All state organs, the armed forces, all political parties and public organizations, and all enterprises and undertakings must abide by the Constitution and the law.Art. 5, 1982 Constitution of China (as amended). who, in violation of law, infringes upon the freedom or right of any person shall, in addition to being subject to disciplinary measures in accordance with law, be held responsible under criminal and civil laws. The injured person may, in accordance with law, claim compensation from the State for damage sustained. * Both Hong Kong and Macau are covered by the ICCPR following their return to China by, respectively, the United Kingdom (in 1992) and Portugal (in 1997). If a person seriously endangers public order or constitutes a threat to public security, the people's policemen of public security organs may forcibly take him away from the scene, detain him in accordance with law, or take other measures as provided by law. assault another or instigate others to do so.Art. 22, People’s Police Law of the People's Republic of China (as amended in 2012). With respect to firearms, Article 10 allows police officers, "in accordance with the relevant regulations of the State, [to] use arms in case of emergencies such as resisting arrest, rebellion, escaping from prison, grabbing firearms or other acts of violence". Other instruments, notably the 1999 Regulations on Use of Police Instruments and Arms by the People's Police, also regulate police use of force. The Regulations generally provide that less-lethal weapons and firearms must only be used when necessary. Firearms may be used by the police if less-lethal weapons and measures prove ineffective. However, the Regulations allow the use of firearms in case of riot or rescue of a detainee from custody. 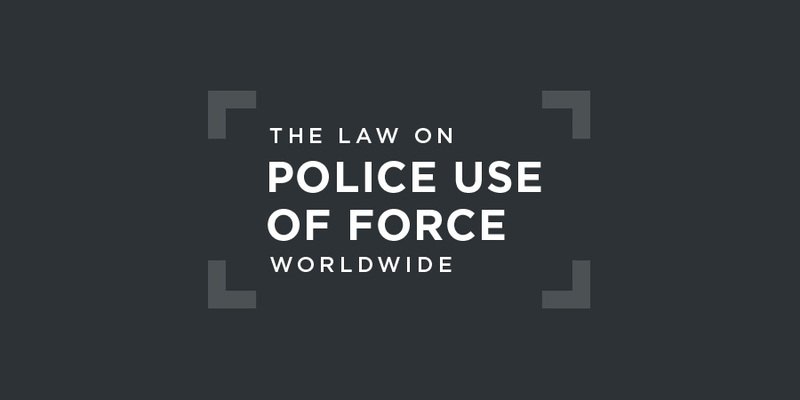 There are specific regulations governing police use of force in Hong Kong, but these are not publicly available. When the police exercise their power, it may not exceed what is necessary for accomplishing their goals, and they shall employ the approaches that can minimise infringement upon people’s rights. ... When the police have accomplished their goals through the use of their power or after judging the situation, believe that the goals cannot be accomplished, they shall stop their operation as allowed by their power or upon the request of the obligor or the interested party. 1. When an extreme mishap is imminent and it is urgent to maintain the public order. 2. When the uproar is reaching the point of causing social disorder. 3. When the person to be arrested or detained by law resists arrest or escapes, or anyone helps him/her resist the arrest or escape. 4. When either the land, building, tools and supplies, vehicles, boats, aircrafts under police’s protection or people’s lives, bodies, freedom, or properties is endangered or under threat. 5. When the police’s lives, bodies, freedom or equipments are endangered or threatened, or there is enough evidence to believe that the foresaid parts will be endangered. 6. When a person carrying a weapon is believed to cause trouble, and he/ she refuses to be at the police’s command after being ordered to drop the weapon. (5) if any prisoner is seizing a weapon by force. in performing their duties, shall accept supervision by the People's Procuratorates and administrative supervisory organs in accordance with law. A specific procedure exists in Hong Kong. To make a complaint about the conduct of any police officer, the complainant must file a complaint at the Complaints Against the Police Office (CAPO), a unit within the Hong Kong Police Force. All investigations by CAPO are monitored by the Independent Police Complaints Council (IPCC). When CAPO has completed the investigation of a Reportable Complaint, it will submit the investigation report, together with relevant files, documents and materials, to the IPCC for review. received numerous reports from credible sources that document in detail cases of torture, deaths in custody, arbitrary detention and disappearances of Tibetans. In addition, allegations have been received about acts directed against Uyghurs and Mongolians.Committee against Torture, Concluding Observations on China, UN doc. CAT/C/CHN/CO/5, 3 February 2016, §40. ensure that all custodial deaths, disappearances, allegations of torture and ill-treatment and reported use of excessive force against persons in the autonomous region of Tibet and neighbouring Tibetan prefectures and counties, and in the Xinjiang Uyghur Autonomous Region, are promptly, impartially and effectively investigated by an independent mechanism.Committee against Torture, Concluding Observations on China, UN doc. CAT/C/CHN/CO/5, 3 February 2016, §41. This case concerned a fatal shooting by a police officer in which he shot and killed two drunk men who had pushed and scratched the police officer while he was discharging his duty. The officer claimed that he only fired when the men tried to grab his gun, this was not supported by the evidence. In the Guizhou Intermediate People’s Court, the officer was sentenced to eight years' imprisonment for intentional killing as even though he was acting in self-defence, the use of force exceeded what was necessary in the circumstances. In 2016, addressing senior government officials, Chinese President Xi Jinping vowed to address the problems of police brutality by putting in place tougher regulations. According to a report in the South China Morning Post, the Minister for Public Security, Guo Shengkun, later emphasised the need to educate the country’s police force to understand and “consciously respect the law.” Guo also called for better training to boost legal literacy and law enforcement capacity among all police officers, especially those at local levels. [We need] to educate the whole police force to consciously respect the law, study the law and abide by the law and to strictly standardise law enforcement to ensure justice. In 2017, an academic paper concluded that there existed a code of silence among Chinese police officers and a "lenient attitude toward the use of excessive force".